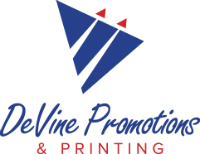 I love these people...DeVine Promotions & Printing is the only place I order business cards for our company because it's hassle free. All I do is send Gaylyn my information, they have our business template on file and she takes care of the rest. I get an approval email and 1 or 2 days later, the cards are delivered. They also do other printing for the company. Once, I needed some business cards asap. I emailed Gaylyn the information and they got them printed up and was to hot shot them to our office. And who delivers them but George, Gaylyn's husband! They are very dependable people. If you let them know what you need, they will do their best to make it happen.